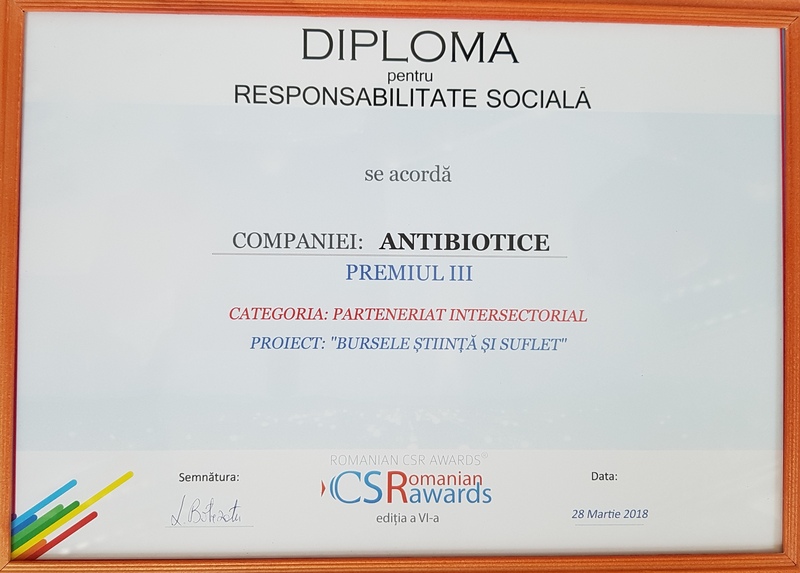 The event organized by CSR Media took place on March 28, 2018, at Ghica Tei Palace in Bucharest, and the best corporate social responsibility (CSR) projects carried out by Romanian companies in the year 2017 were awarded. The participants were a number of 164 CSR projects registered in the competition of 90 companies carrying out social responsibility campaigns in Romania, with 65 prizes and mentions. “For 16 years, Antibiotice has been partnering with the” Pro Ruralis “Association through the Science and Soul Scholarships to educate children in rural areas – children with special skills and superior intelligence, but without any material possibilities, and continues to study at high school and high school opening new windows to professional development and personal development. Antibiotice will continue to develop new social responsibility projects that bring added value and transparency by constantly contributing to the sustainable development of the communities in which we operate, “said Ioana Tode, president of Antibiotice Science and Soul Foundation. The Romanian CSR Awards gala is at its 6th edition and aims to bring the public opinion to the forefront and to highlight the CSR projects and CSR campaigns of Romanian companies being awarded those projects that have led to the improvement and the long-term change in the quality of life of employees, customers and communities in Romania.